Grimal، Nicolas (۱۹۹۴). Histoire de l'Égypte ancienne (به فرانسوی). Livre de Poche. شابک ۲۲۵۳۰۶۵۴۷۱. Ryholt, Kim S.B. (۱۹۹۸). 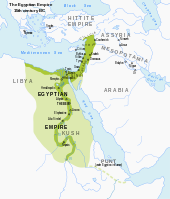 Political Situation in Egypt During the Second Intermediate Period c. 1800-1550 BC. Museum Tusculanum Press. ISBN ۹۷۸–۸۷۷۲۸۹۴۲۱۸ Check |isbn= value: invalid character (help). Clayton, Peter A. (۱۹۹۸). Chronicle of the Pharaohs. London: Thames and Hudson. ISBN ۰-۵۰۰-۰۵۰۷۴-۰. این صفحه آخرین‌بار در ‏۳ آوریل ۲۰۱۹ ساعت ‏۱۲:۴۸ ویرایش شده‌است.